Once again we will be offering golfers the opportunity to choose their own Special Play Number (00, 1 to 99). This will be a great way for you to accommodate those Pro V1 and Pro V1x loyalists who want to stand out within their four-ball with a play number special to them. 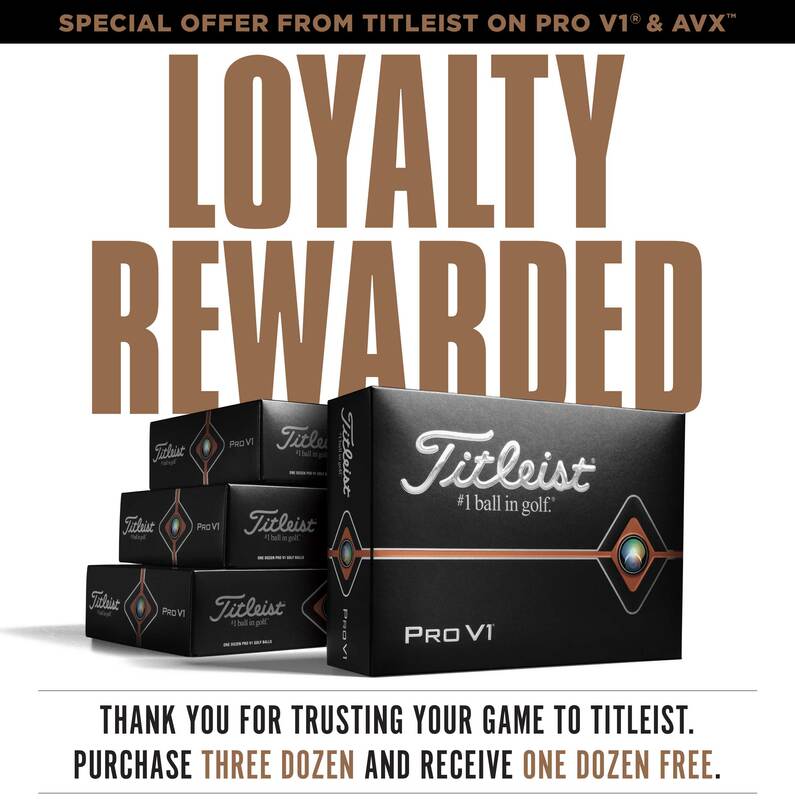 Additionally, we will be offering the opportunity for golfers to choose non-personalised, Standard Play Number Pro V1, Pro V1x or AVX golf balls in Limited ‘sleeve only’ Loyalty Rewarded Gift Box. Maximum of 1 dozen free per order/consumer. Orders can be placed from 15th March 2019 and will ship from 1st April 2019. Last date for orders 30th April 2019. Maximum lead time 4 weeks for personalised golf balls and 10 days for non-personalised golf balls from 1st April 2019 subject to availability. Pro V1, Pro V1x or AVX only. Same model for all 4 dozens. Special Play Numbers only available on WHITE Pro V1 and Pro V1x golf balls. Option 1 - Personalised available as Standard Play Numbers & Special Play Numbers 00, 1–99. ALL 4 dozen must be either standard play number or ALL the same Special Play numbers. Option 2 - Non-personalised available as Standard Play Number only. Upper Case only. Red or black ink only on white golf balls, black ink only on yellow golf balls. No mixed colours in individual orders. Maximum three lines of 17 characters inclusive of spaces on each line. Alpha numeric characters only. Dots and dashes can be included within alpha numeric, but will not be accepted on their own. The printing of any message is at the discretion of Titleist. Registered or trademarked messages will be subject to approval ie. Football Clubs, Brand names etc.